The TSA / TSAH is supplied with a tool kit, medium hook, large hook, and a 2" diameter compression plate. 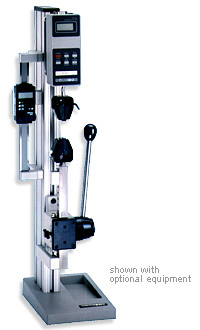 The lever operated Force Measurement Test Stand Model TSA is a perfect solution for quick-action pull testing and compression testing of up to 750 lb of tensile or compressive force. Made of rugged, machined aluminum components, this test stand is durable enough for the factory floor, yet precise enough for laboratory environments. 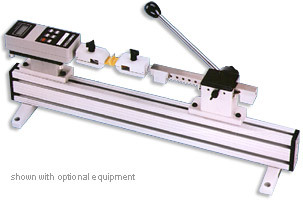 The test stand includes adjustable travel stops and a frictional low force brake. Available in vertical and horizontal orientations. Special modifications are available, including custom-designed fixtures, increased column length, and more. Call 1-888-MARK-TEN for more information.